I think it can safely be said that the plot for James Bond (007) stories are never very complex. They all seem to feature the hero, as suave as ever, coming up against impossible odds as he finds himself in opposition to some evil genius who is hell bent on destroying the world, or at least a large part of it. Along the way he will get the girl, get beaten up and tortured, while he himself will be responsible for a fair bit of brutality and more than a few killings. In the end he will of course triumph in the most improbable circumstances and save the day. All this, of course, takes place in some of the world’s most exotic settings. Anthony Horwitz’s new James Bond Spy Thriller, Forever And A Day, meets all these criteria admirably. It is a turbulent and fast moving story which is easy to read and offers good escapist entertainment. 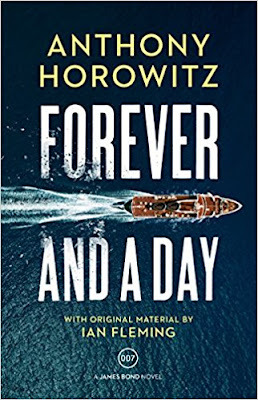 Horwitz, a prolific and successful writer of more than 40 books, was given the blessing by Ian Fleming Publications Ltd and the Ian Fleming Estate to write this, his second book, to feature the late Fleming’s iconic character James Bond. Included in the book is original material written by Fleming – although it is quite difficult to identify exactly how and where in the book it is used. Forever And A Day tells the story of how it all began. It is set in the 1950’s, prior to the events of Fleming’s first Bond book, Casino Royale. After the death of the first 007, Bond is appointed in the position and so the story begins. His first assignment is to investigate both the killing of his predecessor. Along with the brutal criminal underground and drug cartels which operates on the French Rivera. Along with the help of the beautiful and mysterious Madame Sixtine, he uncovers a plot to bring America to its knees. Forever And A Day (a nice Bond sounding title – but its relevance to the story escapes me) is an enjoyable, escapist read which is a fitting tribute to the great author Ian Fleming. In some ways it reads much like a film script, so I suppose we can look forward to the movie sometime in the future. This book should be enjoyed by all enthusiasts of spy thrillers and particularly by those who are fans of James Bond’s antics.